The development of human resources and institutional capacity is key in addressing the multiple socio-economic challenges affecting Namibia and with partners such as the African Capacity Building Foundation (ACBF), the country can develop its human capital, says Tom Alweendo, Director General of the National Planning Commission. Namibia has become the 38th member of the ACBF this week. The institution aims to assist African countries to address capacity challenges through investing in people. “Through networking, it came to light that Namibia has a lot to gain from this foundation. Namibia sees the establishment of the ACBF as a response to severity of Africa’s capacity constraints and the challenge to invest in indigenous human capital and institutions in sub Saharan Africa,” said Alweendo. The two parties have been cooperating without a legal instrument since Namibia gained independence in 1990. The ACBF supported the now defunct Namibia Economic Policy Research Unit (NEPRU), the Namibian Capacity Development Focal Point (NFP) and the Namibia Performance Management System Project financially over the past 22 years. “The foundation and Namibia have been cooperating since independence. The ACBF has granted US$30 million towards developing capacity initiatives in Namibia. Through the signing of this memorandum of understanding, the relationship is now formalised and we can help shape the agenda of the institution. It is not only about receiving funding but we can also now network with other members,” Alweendo said. Also speaking at the signing ceremony, Dr Frannie Léautier, executive secretary of the institution, said Namibia can, through this partnership, address challenges such as access to water and sanitation and jobs for young people. 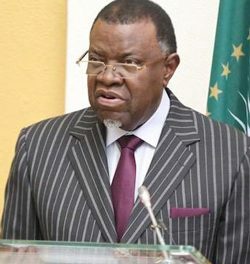 “ACBF hopes to assist Namibia in the following areas: a coordinated and collaborative effort to develop leaders conversant with complex adaptive systems and able to make effective decisions under different scenarios and an effective framework for supporting innovation and job creation at country level. Such a framework will include developing capacity to address the human dimension of innovation, intellectual property rights, patents; enhanced private/public partnership; a more holistic view of knowledge management, including indigenous knowledge and the reposition of universities and think tanks to become generators of new ideas and axes of intellectual capital,” said Léautier. She said the foundation expects Namibia to guide strategic sectors and support entire value chains and to explore with which countries it can partner successfully and with which countries to compete. “Namibia can compete with, for example, Thailand in the manufacturing sector for effective leverage. Namibia should also open up space for creativity, innovation, learning and discovery and see how to attract diaspora and retain talent (the role of universities and think tanks is critical), Léautier concluded. The African Capacity Building Foundation (ACBF) was founded on 9 February 1991 and consists of African governments and the international donor community. The African Development Bank, the United Nations Development Programme (UNDP) and the World Bank, are some of the foundation’s sponsors. The ACBF aims to address challenges such as globalisation including innovative capacity development interventions, development financing, agriculture and climate, governance and leadership matters as well as fragile states and post-conflict countries reconstruction issues. The foundation’s vision is to be the leading African institution in building sustainable capacity for good governance and poverty reduction in Africa.